The formal living room has the homes only fireplace. It is a wide red brick fireplace that burns wood and French doors that lead to the wood deck on the rear of the house. DARIEN — The clapboard house at 30 Hillcrest Ave. is a classic colonial typical of the time period in which it was built. Many of the colonials from the early 20th century were white but this one has a paint job that gives it a contemporary feel. The majority of the exterior façade is yellow but the top portion of the house has a broad stripe of white. The house also has a dark green front door and shutters and white trim. The interior, as with the exterior, has a contemporary feel. The 2,112-square-foot home boasts great flow and architectural detail throughout. Its location also has its benefits. Hillcrest Avenue is across the street from Woodland Park Nature Preserve, Darien’s largest park. There are two entrances to the park; one on West Avenue and the other on Middlesex Road, where there is a small parking lot. The park has two ponds - Turtle Pond and Old Maid’s Pond, hiking trails, a display case with changing exhibits related to the local flora - which includes Christmas fern, Japanese maple and butterfly weed, and fauna - including turtles, deer, and wild turkeys. The house is walking distance to local public schools and it is only a 12-minute walk or quick ride to the Metro North train station as well as downtown boutiques and restaurants. Hillcrest is a private dead end road, and it has something that many town streets do not have - a natural gas line, so this house has gas heat. It sits on a level and sloping property of about a quarter of an acre. To enter this house pass through the fluted columns and under the American eagle house plaque, a symbol often found on colonial houses. Inside, the house features eight rooms, hardwood floors throughout the main level, and a full partially finished basement that adds another 400 square feet to the total amount of living space. 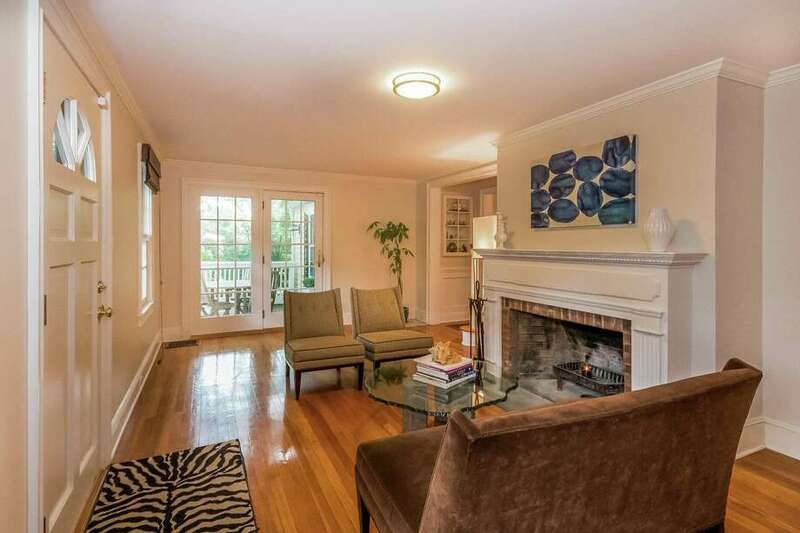 The formal living room has the home’s only fireplace. It is a wide red brick fireplace that burns wood and French doors that lead to the wood deck on the rear of the house. In the formal dining room there is wainscoting on the lower walls, a floor-to-ceiling window that brings lots of natural light into this room, and a built-in corner china cabinet. French doors separate the dining from the family room, which has a vaulted ceiling, a wall of built-in bookshelves and cabinetry. High on one wall is a shelf that could be used for displays of art work, sculptures decorative dishware, or family trophies. Among the kitchen features are granite counters, a large built-in hutch with glass front cabinets, and high end stainless appliances. Off the kitchen there is a back hall that includes a half bath, mudroom, and access to the two-car attached garage. Rounding out the first floor is a guest bedroom, although the floor plan of this house is flexible enough that this room could be used for other purposes. On the second floor there is an office but the first floor bedroom could serve instead as the office. On the second floor there are three bedrooms. The bath in the master suite has a ceramic tile floor, shower, and a decorative ceramic tile surround around the vanity mirror. The master bedroom, office and hallway have hardwood floors while the other two bedrooms have wall-to-wall carpeting. In the lower level there is a playroom with two walls of built-in bookshelves, laundry room, and lots of storage. In addition to the deck, the fenced backyard has a barbecuing/entertainment area. For more information or to make an appointment to see the house contact Kristin Nemec of Houlihan Lawrence Real Estate at 203-829-8998 or KNemec@houlihanlawrence.com.